Le Boudoir Numérique met Madjouline Sbai, during Maker Faire Paris, where she gave a conference on Makers and circular fashion, at the end of November. To better understand the role played by these 2.0 DIYers in fashion more respectful of the planet, animals and humans, the environment sociologist talks extensively, in this first part of this interview, about the phenomenon of fast fashion, this "crazy race" to produce and consume more and more, faster and cheaper. Le Boudoir Numérique : what is fast fashion ? Madjouline Sbai, environement sociologist : Fast fashion is a phenomenon that has emerged over the last thirty years. Consisting of producing always more, faster and cheaper, the fast fashion is characterized by the acceleration of clothes seasonality, so that the consumer does not stop buying. This phenomenon is the symptom of a history that goes back to the industrial revolution with the production of manufactured goods, by mechanized and technical processes, within companies. After the Second World War, the democratization of ready-to-wear made it possible for people to buy clothes without having to manufacture them themselves. The concept of consumption developed during the Glorious Thirty (period of strong economic growth between 1945 and 1973, AN), with a complete economic sector growing around commercialization of ready-to-wear. This phenomenon became problematic only from the 80s, when in order to produce more and cheaper, brands have turned to low-costs labor countries, such as those of Southeast Asia, who now see themselves subcontracting clothes manufacturing. This is the beginning of planned obsolescence (deliberate reduction of the life span of a product to increase its replacement rate, AN). Products become less durable, both in terms of their resistance and trends, since it is necessary to push the consumer back to the store to buy new products. The clothes become disposable. After a few weeks, we do not want to wear them anymore, or we never wear them. In fact, it is estimated that one-third of the clothes in our closets are never worn. This is the big waste that businesses and consumers are taking part in, as we continue to increase the volume of clothing, so that, since 2000, we have doubled the number of garments produced worldwide and by 2020, we will have triple it. During your conference, you mentioned one of the consequences of fast fashion, namely the disconnection between the clothes manufacturing and their sale. What is it all about ? In the 90s, fashion companies chose to keep their headquarters in the North, where product design, marketing and communication are now centralized. And to outsource manufacturing, possibly the cheapest and the fastest one, in countries like China, which have begun to emerge, since the 80s. The subcontractor subcontracts to another one, who, himself, delegates to a third one, until, finally, the garment making process moves completely away from the creation one. From now on, there is a disconnection between the raw material and the final product, with many stores buying only finished clothes, without ever worrying about the initial resources used. Companies have become incapable of tracing products, of identifying what they are made of, of knowing how their finishing is done, whether pollutants have been released into the natural environment or whether the workers are producing them in good working conditions. What are the consequences of fast fashion on the environment ? The main raw material used by the textile industry is cotton, whose cultivation has a negative impact on the environment. Fashion cotton alone absorbs 25% of the pesticides used worldwide. The textile sector is the third largest consumer of irrigation water on our planet, because of cotton growing. 5000 liters of water are needed to make a T-shirt. In terms of manufacturing and transport, the textile sector emits more greenhouse gases than air and sea transport, not to mention the emission of pollutants, such as dyes, in the natural environment, like rivers. There is no lack in indicators on the negative consequences of fashion on the environment. What are the consequences for workers ? With regards to human rights, there is progress, for instance in China, where working conditions are improving, particularly in terms of wages. The situation is changing more slowly in Bangladesh, for example, where a worker in the textile industry earns about $ 30 a month. Above all, it should be known that only 0.6% of the product price is paid back to the worker who manufactured it. One can speak of exploitation, in the sense that the workers know-how is completely discredited. It is necessary to promote solutions favorable to workers, such as those aimed at distributing a larger part of the financial margin into the manufacturing phase, so that subcontracting companies can invest in better working conditions and in workers wages. Absolutely. The fashion industry reproduces exactly the same industrial exploitation of the animal as in the food sector. The animal is used as an object, a raw material meant to make clothes, without any respect for the fact that it is a sensitive being. Poaching to satisfy the growing needs of the luxury sector, abuse when shearing angora goats in South Africa ... many scandals are frequently denounced by NGOs such as PETA (acronym for "People for the Ethical Treatment of Animals", the name of this animal rights defense association, AN). You cannot handle animals like objects. Animals must be respected and their wellfare secured. And the consumer, in this context ? Clothing meets the fundamental need to dress against climatic hazards but also to maintain social and cultural relations with others. According to our expectations of the moment, we all pursue this quest related to the expression of self-image, through the purchase of fashion products. But this research is far too deep to be satisfied by a simple material object and still less by a fast fashion garment without history and without soul. The sirens of marketing sell us false promises and images that have nothing to do with the quality and comfort of the product, the way it accompanies us in our way of life or which it adapts to our morphology. Thus, even if closets are full of clothes, lots of people still say that they want to lose weight, for example. Fast fashion clothes do not help consumers feel better about their bodies and their relations to the world. And what about the message send, when we wear clothes, tainted by the planet destruction and by workers suffering? Nobody feels comfortable with this situation. And finally, in addition to its destructive social and environmental impact, are we certain that fast fashion is a guarantee of success, in the long run, for companies ? Fast fashion is a crazy race. The bigger the size of your business, the more likely you are to negotiate down the price of your supply chain. Because what matters to you is the sales volume. Even if you generate low profit margins on your products, your very aggressive business strategy will allow you to sell a lot, with continuous replenishment of new models, permanent sales in stores, and so on. In this race for low prices, major international brands such as Zara or Primark have greater capacity to resist than competing midsize companies that, less resilient in terms of margins, will not hold the shock over time. So, no, fast fashion does not work. The question that arises from now on is: how to find an alternative to this crazy race? This is where circular fashion comes in, to go back to more reasoned and responsible business models. * Read the second part of Madjouline Sbai's interview on ethical fashion and the solutions brought by Makers, in this Boudoir Numérique article : "Makers and fashion (2/2): circular fashion". * Deepen your knowledge on the current situation in fast fashion and ethical fashion, with some films documentaries, suggested by Le Boudoir Numérique. * To learn more about the Maker movement, read this interview of Christophe Raillon, director of Maker Faire France, on Le Boudoir Numérique. * Madjouline Sbai is collaborating with Oxfam on the Epicycle project, a circular fashion shop, opened in Lille on November 13th. More info on the Oxfam France website, here. 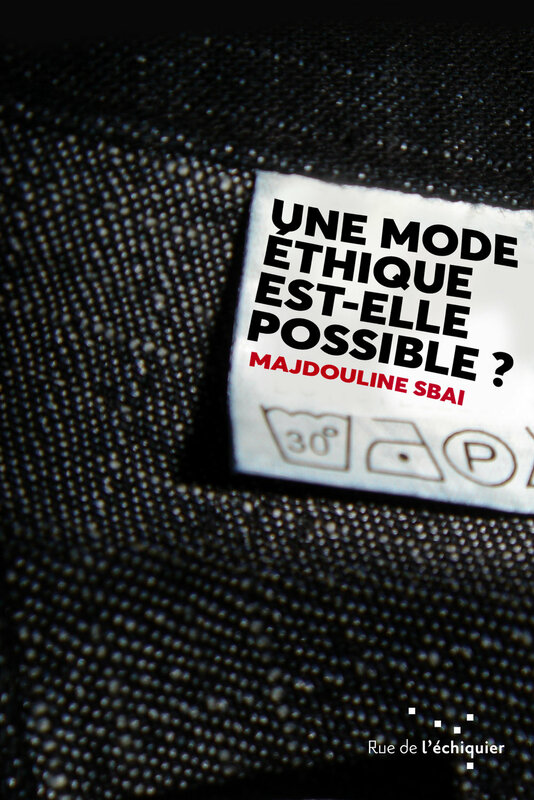 * Madjouline Sbai is the author of the book "Une mode éthique est-elle possible ?" (“Is ethical fashion possible ?”), published by Editions Rue de l’échiquier, in April 2018 (160 pages, 13 euros).